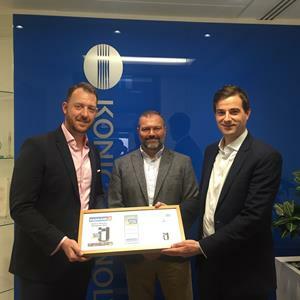 /EIN News/ -- Ramsey, April 16, 2019 (GLOBE NEWSWIRE) -- Konica Minolta Business Solutions, U.S.A., Inc. (Konica Minolta) is proud to announce that its Workplace Hub solution recently received the prestigious Editor’s Choice award by Managed.IT Magazine. The magazine is the only dedicated Managed Services & Solutions magazine for IT managers and aims to provide IT decision-makers with the information they need to improve their technology management, efficiency and capabilities. With the Editor’s Choice award based on three key criteria of design, innovation, and functionality, the editor felt that Workplace Hub was a great example of combining these aspects into an exemplary solution for the workplace. Workplace Hub’s unique proposition is that it’s an all-in-one scalable IT solution, seamlessly integrating hardware, software and services into a multi-vendor platform. As the first entrant into this new market, Workplace Hub is a key player in the technology giant’s intent to continue their innovation legacy that dates back over 145 years, and become a leading IoT services provider. “From the very initial idea of Workplace Hub, we knew we had the potential to disrupt traditional product categories. The challenge was not to only be a first entrant, but to produce a successful solution that simplifies IT for our customers and allows them to work smarter. With our Japanese heritage, it was important to us that the engineering and product development was high caliber, but we also wanted to make sure that the managed services and support is exceptional so that we can provide a truly all-in-one experience for the customer,” explained Dennis Curry, Konica Minolta Deputy CTO and Technology Fellow. This recognition continues Workplace Hub’s award success, adding to its existing accolades given for its strategic brand communications and visual identity. Read the full interview with Managed.IT at https://www.binfo.co.uk/MIT52/22/, and for more information about Workplace Hub, please visit: workplacehub.konicaminolta.com. Konica Minolta Business Solutions U.S.A., Inc. is reshaping and revolutionizing the Workplace of the Future™ (www.reshapework.com) with its expansive smart office product portfolio from IT Services (All Covered), ECM, Managed Print Services and industrial and commercial print solutions. Konica Minolta has been recognized as the #1 Brand for Customer Loyalty in the MFP Office Copier Market by Brand Keys for 12 consecutive years, and is proud to be ranked on the Forbes 2017 America's Best Employers list. The World Technology Awards recently named the company a finalist in the IT Software category. Konica Minolta, Inc. has been named to the Dow Jones Sustainability World Index for six consecutive years. It partners with its clients to give shape to ideas and work to bring value to our society. For more information, please visit: www.CountOnKonicaMinolta.com and follow Konica Minolta on Facebook, YouTube, LinkedIn and Twitter.